It's hard to believe that Supernatural has been around that long personally; I still think of it as a 'new' show, but it's forged a deep backstory and has featured more monsters than you can shake a stake at. And with all that history to keep track of, you're gonna need a visual guide to handle it all. The Essential Supernatural: On the Road with Sam and Dean Winchester from Insight Editions, under license with Warner Bros. Consumer Products, gives unparalleled access to Warner Bros. Television's enthralling hit television series. This stunning 192-page visual companion prepares fans for this beloved show's eighth thrilling season, which debuts October 3 on a new night, airing Wednesdays at 9/8c on The CW. Haunted by the death of their parents in a mysterious supernatural conspiracy,brothers Sam and Dean Winchester (played by Jared Padalecki and Jensen Ackles)hunt down demons, monsters, and otherworldly creatures lurking in darkness. This stunningly comprehensive coffee-table book dissects all seven seasons of the thrilling show and looks ahead to season eight - with deep insights from extensive cast and crew interviews, beginning with a revealing foreword written by the show's creator, Eric Kripke. The book is visually breathtaking, with candid behind-the-scenes photos, revelatory production art, and collectible pullout elements, such as postcards, stickers, photos, and a map that details the cross-country adventures of Sam and Dean. Nicholas Knight has more than 300 writing credits, spanning action, adventure, comedy, romance, science fiction, and young-adult fiction. He has written Supernaturalepisode guides for every season and is a regular interviewer for the Official Supernatural Magazine. Eric Kripke is an award-winning writer, director and producer who's latest adventure series, Revolution, debuts September 17 and airs Mondays at 10/9c on NBC. For his work on Supernatural, Television Week named Kripke one of television's "Masters of Horror" in 2008. 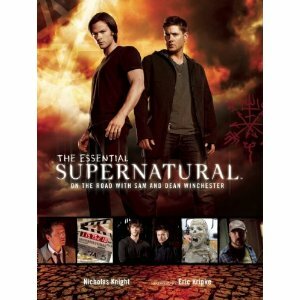 SUPERNATURAL and all related characters and elements are trademarks of and © Warner Bros. Entertainment Inc. I can't say I'm all that familiar with Supernatural; but I can absolutely tell you that if you are, then a Visual Guide might make a very nice little addition to your own personal library of the arcane. I have a bunch of VG's from all kinds of entertainment properties (from comic books to video games) on my shelves and I can't get enough of them. If you love the show, you'll probably enjoy the book. But don't take my second-hand word for it, find out for yourself when all 192 pages of The Essential Supernatural: On The Road With Sam And Dean Winchester arrives on store shelves next month for $50.00 USD.